Permaculture Internship on Maui - permafunK ​ CELEBRANDO JUNTOS..
10m from Haiku town, 10m from a surf/wind surf & kite surf state park beach & Hawaiian Green Sea turtle habitat, 15m from Paia town & 15m from waterfulls & water pools. We have a functional farm & we are ready for interns to start. - Weed wacking food forest areas, around ponds, along main gardens etc..
- Mowing camping areas, under fruit trees etc.. Camping in tents in a bamboo forest area surrounded by fish ponds & the main gardens. ( bunk houses under construction ). You have access to beautiful outdoor hot showers. Food from the land that includes tilapia from the ponds, eggs from chickens & ducks, fruits & vegetables from the gardens. We also provide beans & rice for the interns to use. You are asked to work 4hrs a day Monday through Saturday 9AM-1PM. Afternoons & Sundays are free for you to explore the island. 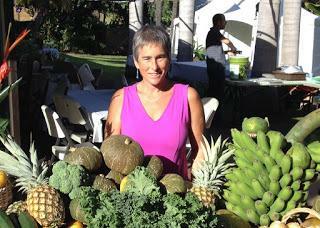 - Twice a week tasks: harvesting papayas, bananas and whatever fruit there is in season & watering the main garden areas. - Monday to Wednesday: Permaculture hands-on learning activities ( work as you learn ). - Thursday & Friday 9am to 1pm ) you will practice farm management & maintainance, using weed wackers, mowing machines, harvesting machines etc..
We can pick you up from the airport Monday, Tuesday Or Thursday after 8pm otherwise you can take a bus, a taxi or an ubber. Also Maui is an easy place for hitchakers to move around as its a common practice. Car rentals are available all over the island & its also easy to buy a second hand vehicle for your time here. In a brief paragraph, please tell us about your interest in permaculture farming, any knowledge you currently have regarding permaculture, and any experinces you have had in gardening or farming. If you have had prior training in permacutlture or farming work, please provide refernces. Share with us your work ethic and how you vision your role in this permaculture community. We are interested in persons who are dedicated to learning and are committed to working the farm. This internship is available during the months of August, September, October, November & December of 2018. You can Paypal us ( perma_fun_Kinfo@yahoo.com ) or use Venmo ( Rosa Maicas ). If you would like to become a certified Permaculture Consultant & designer, we have a Certification program coming up the first 2 weeks of October followed by an Advanced Permaculture Internship. Our Interns would be group leaders in this program and would have priority for this Training. Learn about this Permaculture Design Certification here. Further Internships with longer positions would be available after your 2/3 month commitment with us.